Michael Robertson: Will a MP3.com Strategy Work With Radio Shows on DAR.fm? Will a MP3.com Strategy Work With Radio Shows on DAR.fm? When I started MP3.com I took what was then a radical approach - I let every artist signup without making subjective analysis about whether their music was good enough, but this openness created a secondary problem and the solution to that problem was one of the secret recipes that propelled MP3.com to prominence. Now I'm applying this same formula to my new company DAR.fm. In 1997 when I invented MP3.com record labels acted as gateways to the music business. Artists would send them their music and they would decide who was worthy of moving up in the music business. Because store shelves are limited it was understandable that labels had to act as a filter. However with MP3.com I made the decision to accept everyone without judging the quality. Music is often subjective with one man's noise being another man's symphony, but more importantly on the net there's unlimited shelf space. Critics quickly pointed out that without a quality hurdle the good music would be buried under piles of amateur slop. It was a fair criticism I took to heart and after some thinking I came up with the solution. MP3.com would track user's listening habits on the site and use that data to rank the songs. Songs with more user interest would be ranked higher than those without. Overnight the site became a list of charts with music divided into genres and subgenres all ranked based on popularity. Everyone was free to compete and if many people listened to your music (and bought your CD) then a high ranking would emerge. Charts made MP3.com an interesting place to discover new music. Today I'm announcing DAR.fm 1.0 - a cloud based recording service for radio. (Cloud means you only need a web browser to begin using it - no other equipment is required.) A few months back I launched an early prototype with about 500 stations and 1,500 shows. Version 1.0 of DAR.fm has 10 times more stations and shows to record. More interestingly all the shows are neatly categorized and ranked based on popularity. Similar to what I did with MP3.com we measure what shows are being recorded and rank those more highly. DAR.fm is not just a useful digital recording service but is now also a radio discovery site where it's enlightening to browse through the categories of shows. There are more than 16,000 radio shows in the system from auto racing (38 shows) to wine (8 shows). Each is recordable with a single click on the red record button. 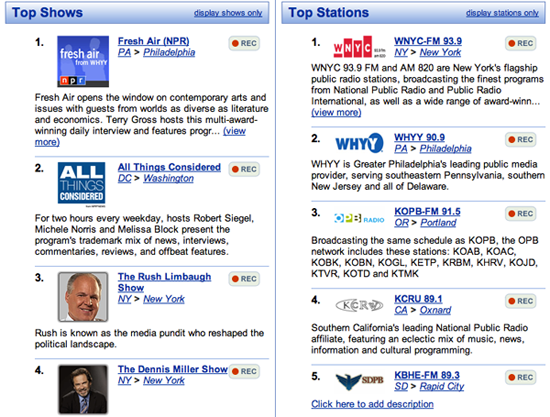 Also new with DAR.fm is regional charts which display what shows and stations are popular in any given state or city. It's fascinating to see the differences in listening habits between CA, NY and Texas. I hope you'll check out the new DAR.fm and see what's popular in your hometown or browse the categories to find a show of interest to you. Recording and listening is just a click away!